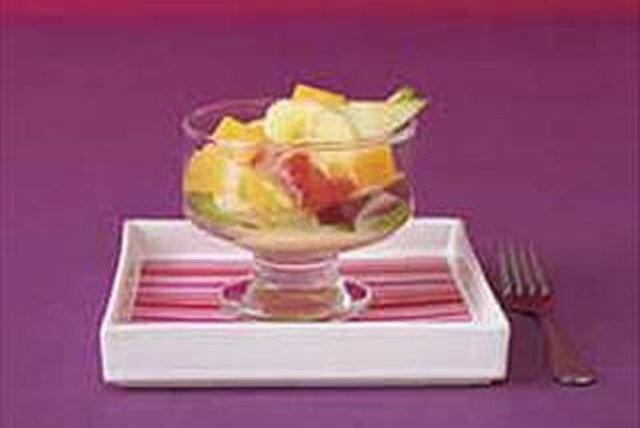 Enjoy a bite of fresh fruit with this Citrus Fruit Salad. Eat the perfect bowl of delicious citrus fruit to cleanse your palate after a meal and get some vitamins while you're at it! Toss fruit and cheese in medium bowl. Combine dressing, honey and cinnamon; pour over fruit mixture. Toss to coat. The dressing and citrus juice help to prevent the cut apples, pears and bananas from turning brown. Enjoy this refreshing fruit and cheese salad all year round as part of a healthful eating plan. The grapefruit and oranges team up to provide an excellent source of vitamin C.